Thanks to Jordan Ruppert from WAHS for sharing about how to check for plagiarism when students are using Google Docs. As nice as it is to pretend that our students always turn in assignments featuring the results of their own independent and unique thoughts, that, alas, is not the universe we live in. Though rare, my students have occasionally turned in something that wasn’t their own creation. One of the negative aspects of the proliferation of technology is that it’s now so tempting (partly, I think, because it’s so easy) to browse to some online source, copy, and paste. 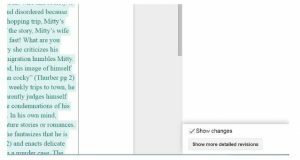 With Google Docs, students can even allow other students to access their own work, enabling a simple copy/paste. Unfortunately, in the last semester I’ve had a few students attempt this. 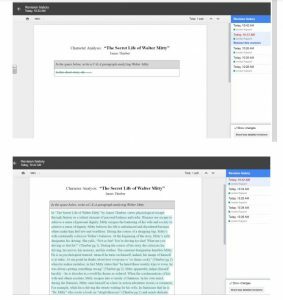 While Chromebooks in the classroom make it a little easier for a student to “borrow” ideas from online sources or one another, using Google Docs can also help to track down cheating using the “edit history” function. The “changes saved” text above the tool bar is also a hyperlink–once clicked, it opens up the edit history of the document. Once on the edit history page, a click on the “show more detailed revisions” button on the bottom right allows the viewer to see a very detailed revision history. This is where the evidence often lies. There have been a few times in the last year where a student has turned in something suspicious; the voice in the writing was clearly different from the writing voice of the student. To check the work, I simply click through the edit history to watch the student’s writing progress–every few minutes, Google saves a draft of the document. When a block of text suddenly appears after the last saved draft, one could reasonably suspect some copy-paste action happening. I’m not advocating checking every submitted assignment using the edit history function (I certainly don’t do that). In my experience, this level of academic dishonesty is rare. But in the case that professional suspicions are aroused, the edit history of a Google Doc can be useful tool for holding students accountable and honest.